Managing and supporting 1.8 million journal articles, more than 10,000 books, and all the graphics for those books, using 3 different DTDs. Yes, RSuite is a fantastic technology, but it takes more than good technology to get these types of results. Here’s an inside look at what this exceptional organization does to get the most from its investment. When conducting an upgrade project, it usually seems to make the most sense to migrate the old to the new and move on—making as few changes as possible and focusing on getting it done. But that’s not how it works at SAGE. They see an upgrade as an opportunity to re-envision workflows, to relentlessly pursue new and better ways to use the system. 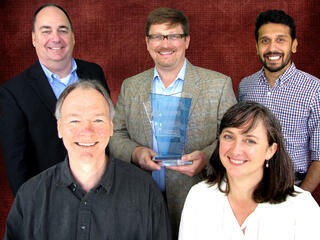 The team at SAGE talks to the business, monitors key industry trends, and re-thinks everything. It’s most common for IT to take the role of “customer,” always following and reacting to the product roadmap of the vendor. However, SAGE views itself as a “partner” and works side-by-side with RSI at all times. 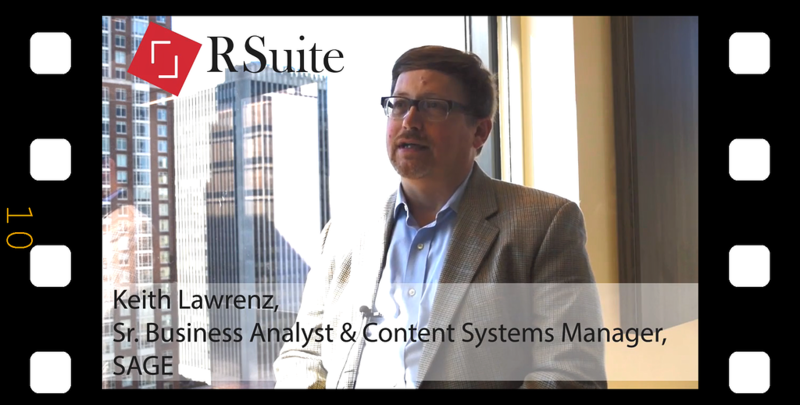 The RSuite team at SAGE has learned the system inside-out and stays active in the community. SAGE wants RSI to be successful, so its people speak at our events, invite us to speak at their events, and travel across time zones to attend our annual user conference. Finally, SAGE sets itself apart in that team members are always empowered to make decisions. Teams work best when they are staffed by a small number of people who can represent the company’s needs. SAGE has dedicated IT staffers who bring a detailed knowledge of SAGE business needs and a thorough understanding of RSuite. That combination makes a project manager’s job very easy! SAGE accepts a plaque from RSI to commemorate 10 years as a client. I always look forward to attending the Digital Book World Conference in New York each year. Unlike some other events, DBW’s sessions are the focus – sessions filled with valuable insights on significant topics from a “who’s who” of industry speakers. DBW also attracts an impressive group of attendees, so there’s no shortage of dynamic conversations to be had with some of the best minds in publishing. This year’s program is all about “Smarter Book Publishing for a Digital World,” which is exactly what we do for our book publishing clients at RSI. So I’m excited to get there and get started! Contact me at jwood@rsicms.com if you want to connect at the event and we can arrange a time to meet.